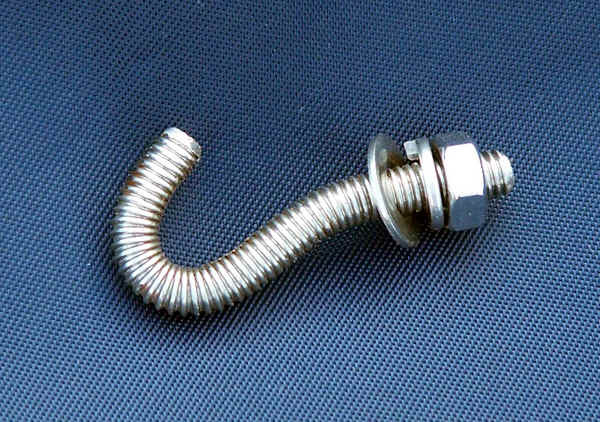 Original parts for securing the parasitic elements shown in Fig 1 used a steel open eye bolt, nut, spring washer, and aluminium half washer to cover the slot in the boom. The steel parts rusted severely within two years at a relatively dry location, at a great distance from the sea or industry. The short life questions the suitability of the materials. Replacement hardware was not available off the shelf in Australia. An enquiry to Hy-Gain (now a part of MFJ) was partially answered after weeks of delay, and failed to provide a full quotation for the replacement parts and freight. Having tried previously to purchase MFJ articles that were not on the shelf from local dealers with absolutely no success, I assessed the chance of getting parts locally or directly from MFJ was very low and I would need to manufacture parts to refurbish the antenna. Fig 2: Replacement bolt for securing parasitic elements. Replacement for original eye bolt is a hook bolt made from bending a piece of 4mm stainless steel threaded rod. The rod was bent in an ordinary engineers vice using a piece of hardwood to apply the bending moment, see Fig 2. Fig 3: Refurbished parasitic element fixing. Replacement for original aluminium half washers manufactured from a piece of 40x3mm flat aluminium, cut to 30mm length, 4.5mm hole drilled in the centre, and bent 40°. Fig 3 shows the finished fixing. These parts had to be made for the 13 parasitic elements. The screws on the 10-24 screws on the driven element were replaced with stainless ones before installation to accommodate a box for the balun. The driven element survived without corrosion as a result. 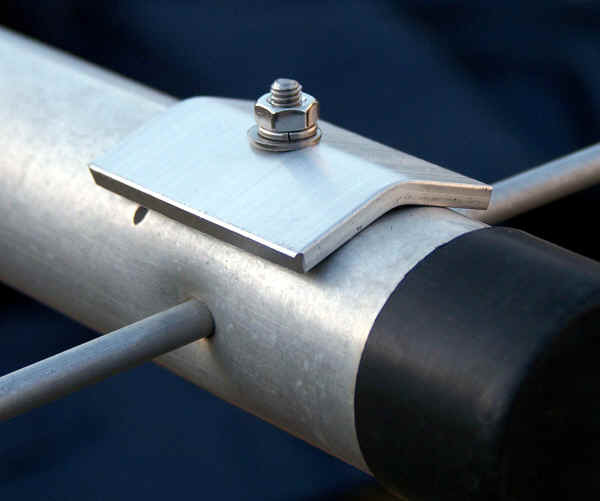 critically assess the maintenance issues (eg steel components) of an antenna of this type before purchase.